This deal from the Taylorsville Plato's Closet is pretty interesting. If you sell $20 worth of clothes to their store they will give you 20% off of your next purchase. 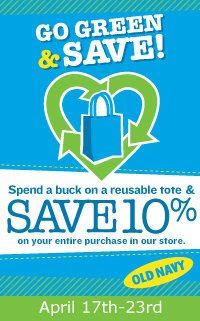 Thrifting and consignment shopping are sustainable practices.... so get your green on and save. Does anyone else know of any noteworthy Earth Day savings? Leave a comment!